Photographer Jessica Hines built a house on a swamp in southeast Georgia, not far from Savannah. Her reasoning was simple: "It is home to a large number of animal species and seeing the natural world everyday from my windows makes me happy," she explained to The Huffington Post. It's not hard to see why. There is, however, something uniquely enchanting about Hines' habitat. 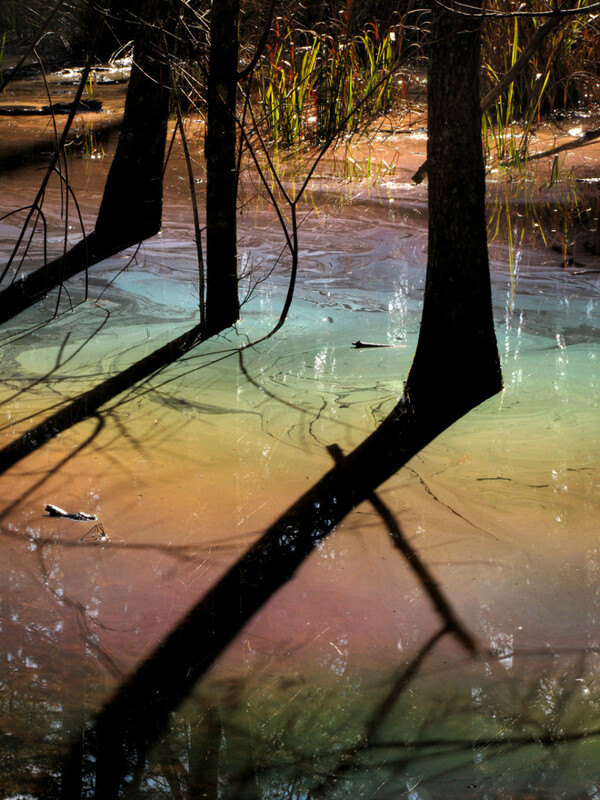 Every January and February during sunny days, a film of rainbow light stretches across the swamp's surface. The colors result from plant oils and pollen forming a monomolecular film that reflects and refracts a spectrum of light. Hines compares it to the colors seen on a soap bubble. When Hines noticed this natural phenomenon, she purchased a pair of chest-high waders to photograph the colors at ground level, at their most intense. "Later in the spring when the color faded to silver, I continued photographing because I had become fascinated by the way light and shadows move across the water and how quickly it all changes," Hines explained. "I love the meditative experience, the quiet, noticing small details –- tiny green water plants emerging in the spring, the green returning to the trees, mushrooms and fungi on floating logs, evidence of beavers and other animals. I continue to photograph the water year round to experience and record the seasons." 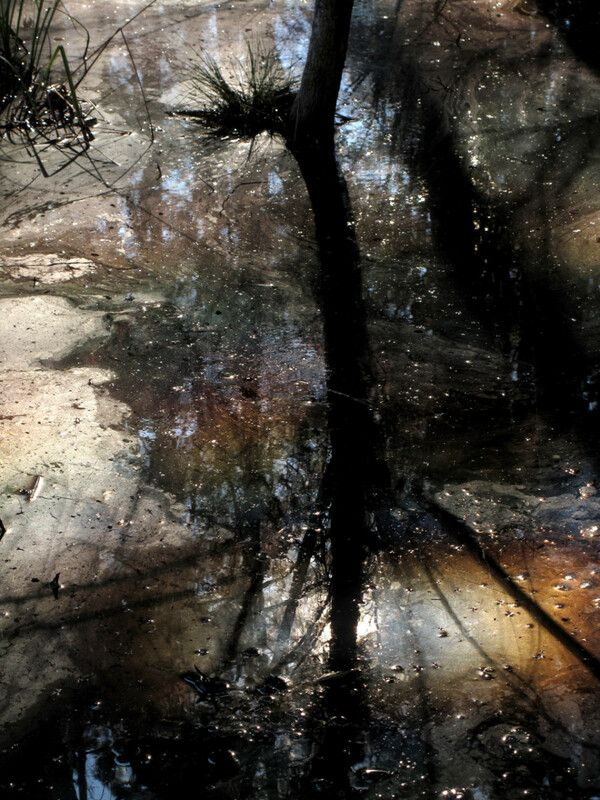 Hines' series, titled "Spirit Stories," began in 2011 and is ongoing -- she recently purchased an underwater camera. As the title suggests, the captured images are not only homages to nature's beauty but also to the supernatural powers hovering just below the surface. "When I spend time alone in the middle of the swamp, I 'tune in' to the place, becoming more acutely aware of my surroundings than I would be when not photographing. I think of the process as a kind of meditation." The hypnotic images, like crystal balls splayed atop a marshy expanse, toy with photography's capacity to capture what is "real" versus what the eye perceives. Moreover, they point at the magical details sprinkled throughout the world we occupy, and the precious beauty all around us. "In this time of mass extinction, of grotesque abuse of the land all over this planet, I photograph a hidden dimension or 'spirit' of this natural world –- one that begs to be paid attention to, to be saved." "I hope that viewers develop a sense of awe at the natural world," Hines concluded. "I hope to reveal a magical, and mostly hidden beauty that inspires viewers –- and in a perfect world, would inspire them to save it."